Eighty-three brains obtained at autopsy from nondemented and demented individuals were examined for extracellular amyloid deposits and intraneuronal neurofibrillary changes. 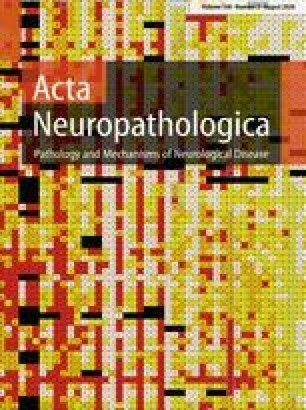 The distribution pattern and packing density of amyloid deposits turned out to be of limited significance for differentiation of neuropathological stages. Neurofibrillary changes occurred in the form of neuritic plaques, neurofibrillary tangles and neuropil threads. The distribution of neuritic plaques varied widely not only within architectonic units but also from one individual to another. Neurofibrillary tangles and neuropil threads, in contrast, exhibited a characteristic distribution pattern permitting the differentiation of six stages. The first two stages were characterized by an either mild or severe alteration of the transentorhinal layer Pre-α (transentorhinal stages I–II). The two forms of limbic stages (stages III–IV) were marked by a conspicuous affection of layer Pre-α in both transentorhinal region and proper entorhinal cortex. In addition, there was mild involvement of the first Ammon's horn sector. The hallmark of the two isocortical stages (stages V–VI) was the destruction of virtually all isocortical association areas. The investigation showed that recognition of the six stages required qualitative evaluation of only a few key preparations.